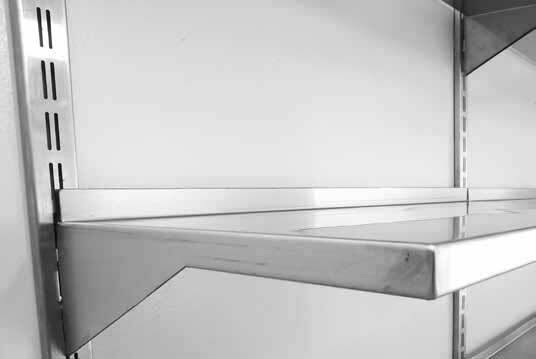 Franke Model Z- Series Adjustable Shelving manufactured from grade 18/10 stainless steel 1,2 mm thick. One piece shelf and integrated bracket with a 25 mm apron to front and sides with 30 mm turn up at back and safety edge on corners. Franke Model Z- Series Wall Bands manufactured from grade 18/10 Stainless Steel 1,2 mm thick. Available in 1000 mm; 1500 mm and 1800 mm Lengths and are double slotted to allow for two shelves to be lined up next to each other on a single wall band with very little space between shelves. Optional: Grade 316 Stainless Steel, Solid or Perforated Shelves, 300 or 400 mm Wide Shelves. Diagram of the perforated Z-Series shelves. Diagram of the solid Z-Series shelves.